The above case study outlines the potential value offered by electronic healthcare records (EHR) but also raises a number of issues. The case material is comprehensive but, in essence, focuses on the improving the management of doctors’ offices through the application of information technology and systems. The requirement for this case study is to analyse the IT value issues of EHR so that a business case can be developed for the management of a doctor’s practice. You are required to collect data in respect of EHR and doctors’ practices within Australia. Firstly obtain an understanding of how General Practice functions, the business context and the key processes. Then select an EHR vendor operating in Australia that supplies EHR system solutions to doctors’ practices. Establish the solutions they provide: functionality of systems, IT architecture, risk and security, costs and benefits, implementation strategy, vendor background information. what special regulatory, social and ethical circumstances do they operate in? What are areas of breakdown or problems in the practice? What processes and services do they perform? Who are the key stakeholders, their needs and requirements? Who is a Vendor offering software solutions? What functions do they offer? What risks are there in implementation? What are the costs and benefits of the solutions? Patient Centred Services: It is important for the general physicians and practitioners to understand the health requirements and needs of the target customers and patients based on the characteristics of the diseases and illness. It is the ultimate individual experience of the general physicians to detect the reason behind the illness. In addition, the general physicians and practitioners are strongly responsible to give patients relief from the illness and diseases. The needs, desired health consequences and values of the patients always can be considered as the major objective and responsibility of the general physicians and practitioners. Care Continuation for the Patients: Similar to the detection of the reason behind the illness, the general physicians and practitioners are always responsible for the care and sustainability of the health of the patients. These general physicians and practitioners always need to develop resilience, wellbeing, and good health of the patients through the consideration of the effective doctor-patient relationship (Babichenko et al., 2016). The continuation of the sustainable and care activities by the general physicians and practitioners can be ensured through the enhancement of effective teamwork, resource implications, and adequate services. Whole body Care of the Patients: The general physicians and practitioners are highly responsible to check the health needs of the patients. Full body check-up can be considered as the major needs of the patients in the case of complex and serious illness. This is acceptable that the majority of the general physicians and practitioners need to advocate, implicate and counsel the enhancement of change management approaches to take care of the care for the patients and the family members. Collaborative Clinical Activities: The general physicians and practitioners need to adopt the collaborative workplace performance with other members and staffs in the clinic to ensure good discipline, effective care, and successful outcomes. The important clinical information should be flowed ethically and transparently within the team to ensure high-quality services. Effective Quality Management and Improvement: The general physicians and practitioners are also responsible for maintaining sustainability and quality of the healthcare services in order to assess and monitor the professional abilities. The evaluation of the skill, competency and performance level of the general physicians and practitioners can help them to improve the degree of patient health care services. Overall, it is also essential for the practitioners to evaluate the need for the implication of the change management applications in the healthcare services if needed to improve overall quality of the services. The need of the patients and their family members is highly important in the context of the community services (Dotti et al., 2017). Overall, it is acceptable that the majority of the general physicians and practitioners should focus on effective health care services quality improvement aspects through the consideration of the team working, leadership, planning, data management and information management processes. Clinical, Ethical and Professional Standards: The effective and transparent professional standards generally help the general physicians and practitioners regarding the development of the essential framework for the improvement of the decision making process under a complex situation. This is also essential to consider the ethical standards to maintain transparency and governance in the overall healthcare system (Lakhoua et al., 2016). The general physicians and practitioners also need to become ethically responsible regarding utilisation of the public resources. Minimum utilisation and maximum output can help in better strategy development and implementation process, which can result in caring and high-quality patient care services. Greenway Medical presently a positively settled conviction in medical industry of Australia that legal and ethical considerations are irreplaceable to remedial practice in the preparing for the care of the patient. With the advances in therapeutic sciences and creating many-sided quality of the authentic structure in current society and growing consideration, regarding human rights and changing great models of the gathering all around, masters and other wellbeing mindfulness workers alike are frequently received in troublesome challenges in various viewpoints rising up out of systematic practice. Communication: This is the major area of breakdown in doctor’s practices. Faulty communication making the system error and it is taking time to resolve the actual issue. Cost: It is identified that IT system in medical practices is becoming a soar. Therefore, maintenance cost is very hurdle for implementing HER within doctor’s practices. Overall, the general physicians and practitioners is acting collaboratively with nurses, counsellors, and other important staffs to deliver integrated and accessible patients care. Aspects should lead, co-ordinate and support the flexibly constructed clinical teams (Bosman et al., 2016). This will help a clinic to contribute effectively to the external clinical group members. Both the internal as well as external team members is acting collaboratively to ensure effective patient-centred services. Suppliers, Patient and Financial Community: These are the key stakeholders that plays important role in running the business of Greenway Medical. Suppliers supplies the external instrument including medicine. Doctor and Nurses: These are the internal stakeholders that helps in serving the patiaent with care. Insta HMS can be considered as a popular and efficient vendor software program, which is also considered as the integrated software application. It generally enhances the billing, appointment and other types of clinical management activities quite effectively. Insta HMS software application is a clinical service providing software application. The company was established in the year 2008. This is also important to discuss that almost 300 practices have been considered by the Australian practitioners. The company is headquartered in Brisbane. The branches of the company are spread all over the Australia in several popular cities. The branches are developed in Perth, Sydney, Adelaide and Melbourne (Tarkanyi et al., 2017). Insta HMS is selected as the sixth top most vendors by NEHTA. NEHTA is popular as the handling and implication of eHealth services in the clinical organisations across Australia. This specific medical software application is effectively backed by several important stakeholders in the healthcare service providing industry since last 70 years due to efficiency, quality management and higher degree of technological advancement. It is important to state that Insta HMS generally use the efficient client-server technology-oriented applications during the time of the network processing process, which enhances effective speed of the network. This particular software application has established own server for better communication and overcome the challenges regarding dependency on other third-party vendors (Wang et al., 2017). This particular software application is also considered as an independent platform, which operates on both Macintosh and Windows. Insta HMS is generally developed on the basis of industrial-strength database. It helps to improve the degree of quality and efficiency of the overall activities. Apart from the advantages, there are different types of the security and risk issues. These issues are developed below. In terms of the inefficient and tedious functioning, the record keeping activities can be affected. These challenges can affect the care activities, services providing activities and good health of the patients. According to the reports of HRSA, different types of natural disaster can cause the challenges like data loss, record loss etc. The cost of the EHR system is more than hundred dollars and the consumption cost may be reached to the thousands of dollars. It may affect the financial stability of the clinics. After the installation of these services, borrower may get effective results after huge time period. It also may affect the financial stability of the firms (Wenzel et al., 2017). Under limit server challenges, inefficient data transmission challenges, remote scope related challenges as well as the extreme repetition absence can cause technical errors, which can affect the sustainability of the overall outcome. It is important to accept that the cost of the Insta HMS software applications may go to 750 Australian dollar on yearly basis. On the other hand, the cost of the hardware systems also can be considered. The hardware applications include printers, scanners, peripheral devices, graphic cards and computers. It can go to 1000 Australian Dollars. In addition, the data backup cost also can be considered. The cloud reinforcement system can cost almost 12 Australian Dollars on monthly basis. There are several benefits of EHR, which are discussed below. It helps to provide appropriate and trustworthy information to the clients. It acts like a time efficient model, which records, keeps, and present data in a time efficient manner. It also helps in the prescription of the reliable and safe medical oriented and clinical oriented services. It also helps the users and clients to save the security and privacy of the data and information. It helps to reduce overall operation management cost through the consideration of the reduced paperwork. 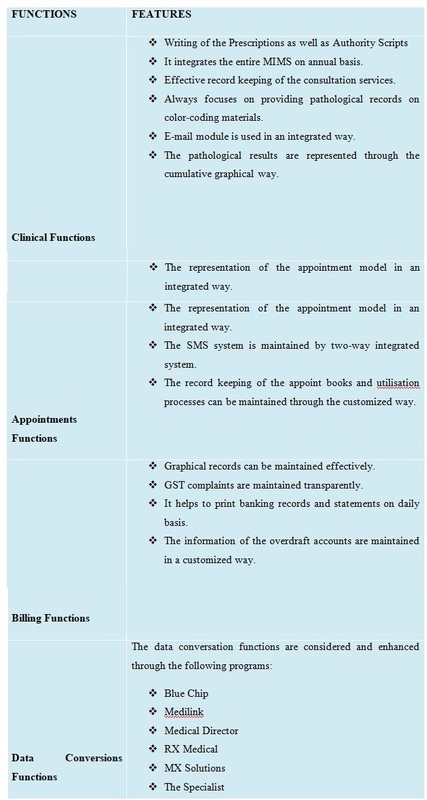 The implication process of the EHR system can be completed through the consideration and application of the following six steps. The assessment pjhase generally helps the clients and users to assess the required steps and elements, which should be installed to improve the quality of the healthcare services through adequate leadership and managerial approacjhes. In planning phase, the users and clients need to ensure effective planning regarding the intended workflow of the processes and activities. It also includes the development and creation of the unique ideas to improve the efficiency of the overall system. It also helps to develop a contingency plan. In selection phase, the users are responsible to select the most cost and time efficient plan through the consideration of the best utilisation of the high quality resources. In the implication phase, training, pilot testing, chart abstraction plan, and data migration activities should be ensured. In the evaluation plan, the improvement of the quality, stakeholder engagement, collaboration process, and the privacy and security application process is evaluated. In the improvement phase, application, care, leadership, ethics, professional standards, and goal development approaches should be considered for better improvement. Babichenko, D., Druzdzel, M. J., Grieve, L., Patel, R., Velez, J., Neal, T., ... & Jenkins, S. (2016, May). Designing the model patient: Data-driven virtual patients in medical education. In Serious Games and Applications for Health (SeGAH), 2016 IEEE International Conference on (pp. 1-8). IEEE. Bosman, A. J., Mylanus, E. A., Hol, M. K., & Snik, A. F. (2016). Wireless and acoustic hearing with bone-anchored hearing devices. International journal of audiology, 55(7), 419-424. Dotti, A., Wenzel, H., Elvira, D., Genser, K., Yarba, J., Carminati, F., ... & Ribon, A. (2017, October). Software aspects of the Geant4 validation repository. In Journal of Physics: Conference Series (Vol. 898, No. 4, p. 042030). IOP Publishing. Lakhoua, N., Khanchel, F., Laifi, S., & Khazemi, S. (2016). SYSTEM ANALYSIS OF MEDICAL EQUIPMENTS FOR HEALTHCARE MANAGEMENT. Annals of the Faculty of Engineering Hunedoara, 14(4), 17. Refai, A., Merouani, H. F., & Aouras, H. (2016). Maintenance of a Bayesian network: application using medical diagnosis. Evolving Systems, 7(3), 187-196. Tárkányi, F., Hermanne, A., Ditrói, F., & Takács, S. (2017). Activation cross section data of proton induced nuclear reactions on lanthanum in the 34–65 MeV energy range and application for production of medical radionuclides. Journal of Radioanalytical and Nuclear Chemistry, 312(3), 691-704. Wang, G. S., Roosevelt, G., Fagan, K., & Hoppe, J. (2017). Pediatric Emergency Physician Knowledge and Utilization of Prescription Drug Monitoring Program. Clinical pediatrics, 56(1), 80-82. Wenzel, H., Folger, G., Konstantinov, D., Pokorski, W., Carminati, F., Ribon, A., ... & Genser, K. (2017). DoSSiER: Database of scientific simulation and experimental results (No. FERMILAB-CONF-16-508-CD). SISSA.